Unstable Equilibria are EXCITING. They live opposite of stable equilibria I guess I should talk about stable equilibria as well, but they aren’t nearly as interesting! Unstable Equilibria are the charged and tense moments in a system where ALMOST ANYTHING can happen! …Actually, that’s not true. Usually unstable equilibria have several very predictable outcomes, the exciting part is you don’t know which predictable outcome it’s going to follow. For example, balancing a pencil on it’s pencil tip is unstable. Theoretically there is some ideal spot where the center of gravity of the pencil is exactly on top of the pencil tip. But in practice, as soon as you let go and remove the external forcing of the system, the pencil falls to the table in a predictable manner. However, when you let go you can’t always predict which direction the pencil will fall in. Thus, the result is interesting and worth studying– unless you are pushing the pencil on purpose– you cheater. Mathematically, an unstable equilibrium is a state where the system will stay but if the system is near (but not equal!) to the unstable point the sy stem diverges away from the unstable equilibrium to a stable one. Stable means if you are anywhere near the stable equilibrium you are drawn to it. Here the pencil is in a stable equilibrium when it is lying flat along the table. The unstable equilibrium is when you try to balance the pencil on end. 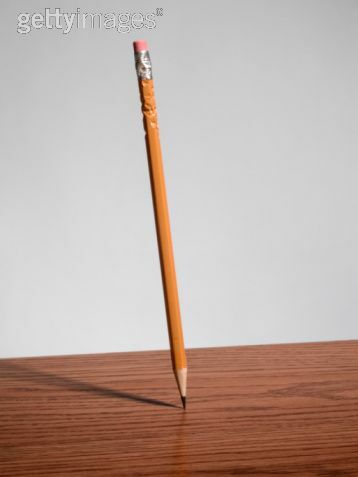 This is because when you are not exactly on balance, the pencil will fall back to the stable state. Okay, you can be sassy if you want and tell me that if the pencil is new it will have a stable equilibrium when you balance it on the eraser side. I would agree with you. I would also suggest that the pencil lying flat on the table is a much stronger stable equilibrium than the eraser balancing. Just something interesting to think about that the next time you are trying to balance your pencil at work or school.